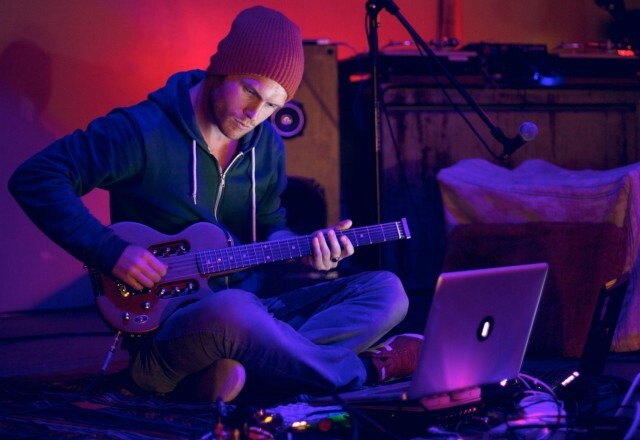 Christopher Willits playing live at San Francisco’s Public Works in October of this year. Photo courtesy the artist. Sound and light artist, guitarist, Max patcher, and all-around sonically-fascinating guy Christopher Willits has opened up his “Tiger Flower Circle Sun” record on Ghostly to remixing. Halfway through the project, we talk to Chris about what’s going on – and what the results so far sound like. 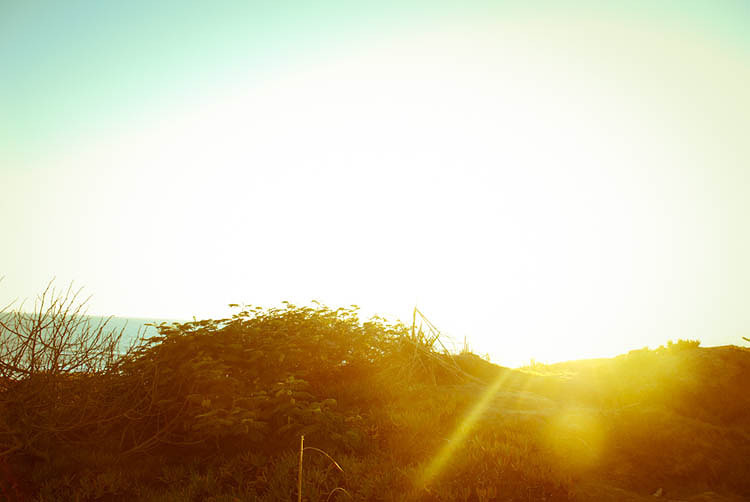 And we share, from earlier this fall, a composition in which you can recharge. The project begins not with stems, but with samples, the raw materials on which the album was based. Christopher walks CDM through the audio highlights, one sample at a time. Along the way – as with all these samples – you begin to appreciate the process by which Christopher makes his decisions, how he moves from samples like pieces of wood to the finished structure. And of course, by opening these up to remixing, you have an opportunity to hear the work differently in his finished, released form, as well as to find your own, distinct decision-making process. It’s perhaps obvious in a remix project, but what this does is to allow the sounds a life separate from the fixed set of decisions that produced the album. I think it’s fun to play the set like an album. I’ve heard these pieces so many times that it’s really refreshing to me to hear them alone. Now I hear the pieces differently. That was actually one of the thoughts behind sharing all of these sounds, so people can hear the layers, and if they wish, tune their ears to the subtleties and intention I wanted to create in the mixes. “The stuff i’ve heard so far is AMAZING,” Christopher tells us. “I can’t wait to feature the best of the best. We’ll be releasing a free comp on [Christopher’s experimetal label] Overlap and Ghostly will feature my favorite remix on a free comp, too.” Winning remixes get Ableton and SoundCloud prizes. Let’s hear a few words from Christopher about the sounds he’s produced. 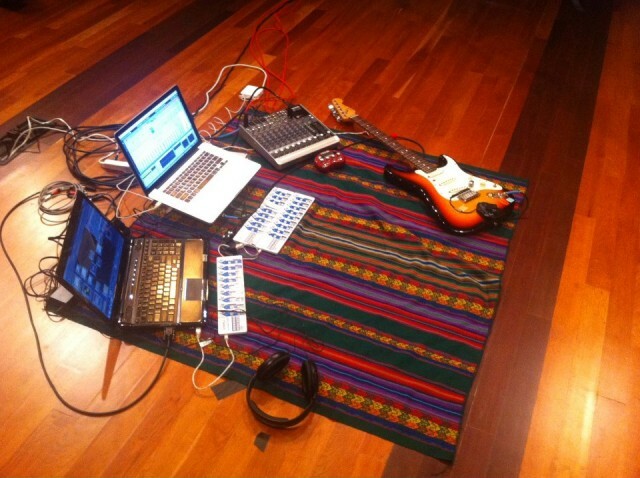 Christophers’ setup at Stanford in October – minimal but effective, with a Mac running sound and a PC running Touch Designer for visuals. And yes, that’s one little Line 6 POD in there, plus some three KORG nanoKONTROL controller devices. Image courtesy the artist, used by permission. A lot of the samples are about variation of common materials, so there’s plenty to explore. Christopher tells us that just one sample – like this guitar solo – can take on very different meanings with different processing, heard in two variations. This tone is created from a custom-made Big Muff > BOSS distortion > Fender Twin with a couple power tubes removed for low volume and max distortion. This is a trick that ted from Flipper showed me around that time, and it created the exact orange laser beam i was hearing in my imagination. I set the process to be only the guitar recordings. With this release, I gave myself a new set of constraints and permissions, allowing my imagination to add whatever comes up for me. No judgement on which one is better to me, they are just different. There are infinite possibilities within any process I determine, yet discerning the process that resonates with my true intention is what creates the shapes and forms and colors that feel like love. …my great friend Jeff Pierre – one of the best drummer I’ve ever worked with, and the youngest, as well. All of Jeff’s takes were one take; this sample is shortened from the original length, but you get the idea. I just love the lightness and feel of this sound — like the funkiest insects in the jungle, getting down. Someone please make a disco track out of this. Me and my friend Reiko were messing with patterns; then we would find a loop. We were laughing so hard as we were playing this stuff. Check your volume for this one — probably should have exported it at a lower volume for this set! The heat of this, the crushed distortion, is from a technique called input flipping on the SSL. This is an input flip with the preamps cranked, with odd harmonics. Ryan (Ryan Kleeman) and I just about lost it when we first input flipped like this for a distorted sound. It became a theme in a sense that resonated with this orange laser beam electromagnetic sound that much of the work stems from. You can also hear it here- and a few other places on the record, to a less extreme degree. There is something about this texture that has a cleaning function to me. Washes things off, away, cleans the ears out. Resets your space. The ambient layers sample was to create more depth of field in the mix, have it floating behind at a low volume, but it was not doing was I wanted it to, so I cut it out. GOLD is a 24 minute and 17 second sound bath / ambient piece to soak into. Listen, relax and recharge. This harmonic weaving of sound was created with the vibration of affinity, love. After working on this project, I’m realizing so tangibly what I’ve always known — that any mix is a sonic photograph of vibrational affinity, and even with a grounded intention behind any mix, and a very clear outline for a process in which you allow that intention to emerge, there are infinite possibilities of expression. Infinite. It is so beautiful.